working on the new user interface with Björn. we went through various different interface designs and decided to settle on this. 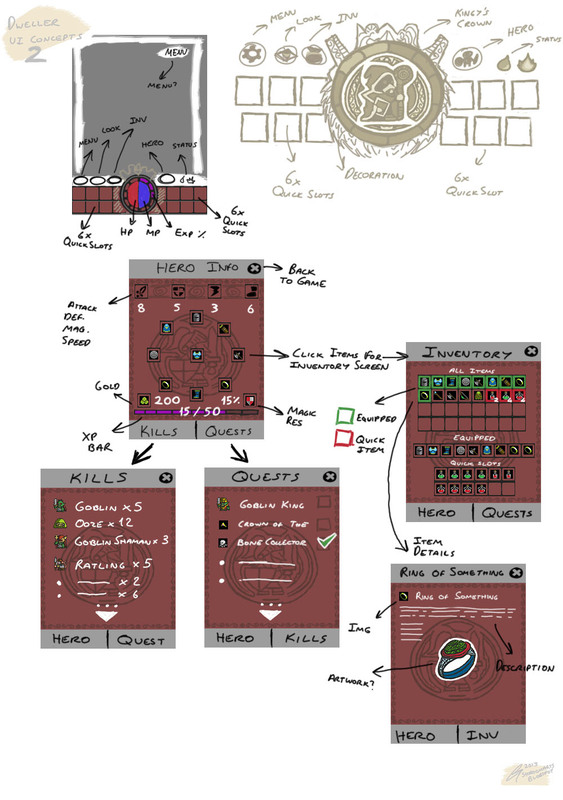 These pics are work in progress, hero information screen will be like the one on the left and the the inventory screen will have 12 equipment slots instead of 9. the in game interface will have 12 quick items around a radial that shows mana, hp and exp. Will add some decoration around it without obscuring the game area. So, does anyone have any opinions on this? Good or bad? Personally I like it very much. The game will feel more "gamey" while still retaining it's roguelikeness. Don't forget on your list of things to do was a quick swap for alternate quipped items -ie quick switch from 2 handed weapons to single handed with off hand item ie sheild. 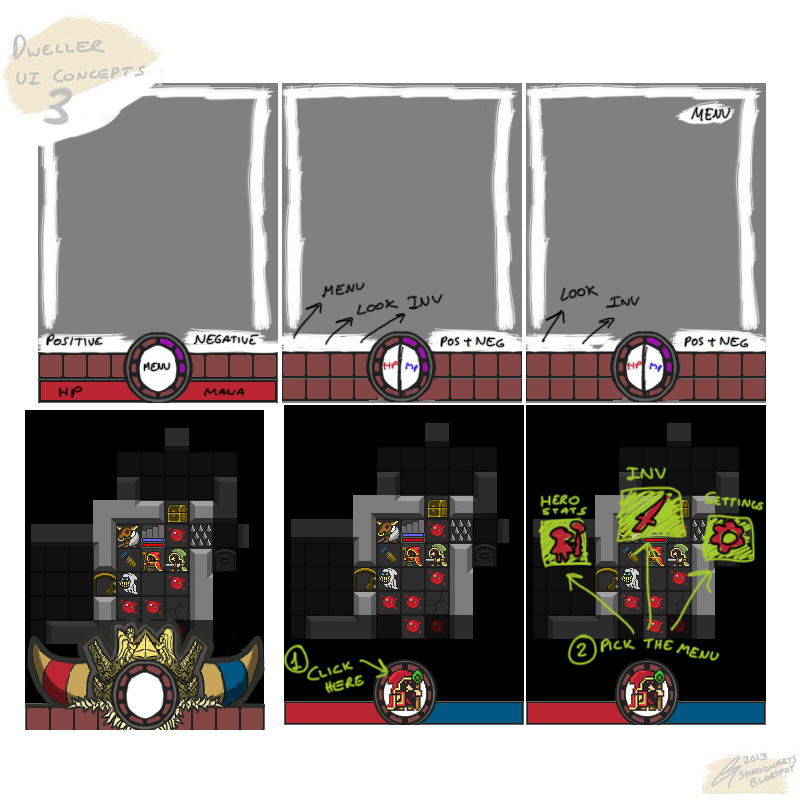 - maybe give us 10 quick slots and one double one on the right side just below where the attack button we discussed -this double one can hold any two items that when pressed will swap with the corresponding items from equipped items slot and at the same time the removed item(s) now appears in the double quick slot. swap out should still take one game turn but it makes game play faster as you do not have to spend real time re-equipping. I also like it. But those "some of the stuff that won't be used" is also okay, some of it perhaps. I like the inventory system but I don't feel we should use the diablo HP,mp display. I don't feel we should use the diablo HP,mp display. If you are referring to the orb in the middle as the diablo display I do agree, I would have preferred having the hp and mana as bars to the left and right but Björn wanted it to feel gamey and as compact as possible, so we had to use colourful bars instead of numbers and having them inside the orb gives 12 quickslots instead of 6 so i cant deny the fact its rather effective the way he wants. there is so limited space for the 240x screens but i think it can be possible to add tiny icons next to outfit locations. this double one can hold any two items that when pressed will swap with the corresponding items from equipped items slot and at the same time the removed item(s) now appears in the double quick slot. Maybe do a poll for the users we have here in this forum, a vote or something if we should do such things. Anyways still a good interface but if the gamers does not want the new gui what will their reactions be? Though I really appreciate that such improvements has been happening to dweller . . .
Guys, if you want to insert new interface to the game, you need to do it like an option. I don't like idea with health/mana/stamina(in future, I hope) bars, numerical showing is most best on the 240x screens, also interface must be compact on mobile devices(touchscreens and devices with keyboards), also all additional panels,like quickslots, should be hidden then they doesn't need. Also may you should do an interface design more Dwellerish, not like in Diablo? About inventory screen - Almost perfect(for me, of course). And one little ask if you will do(I hope, that you will do) a new interface: Do it maximum custumizeble(more settings), please. I like the idea of keeping the existing interface but only as an option in settings somewhere. Under interface you can pick decorative or plain. The default would be the decorative which I really love... everything since mr shroom came on board has just enhanced dweller so much. 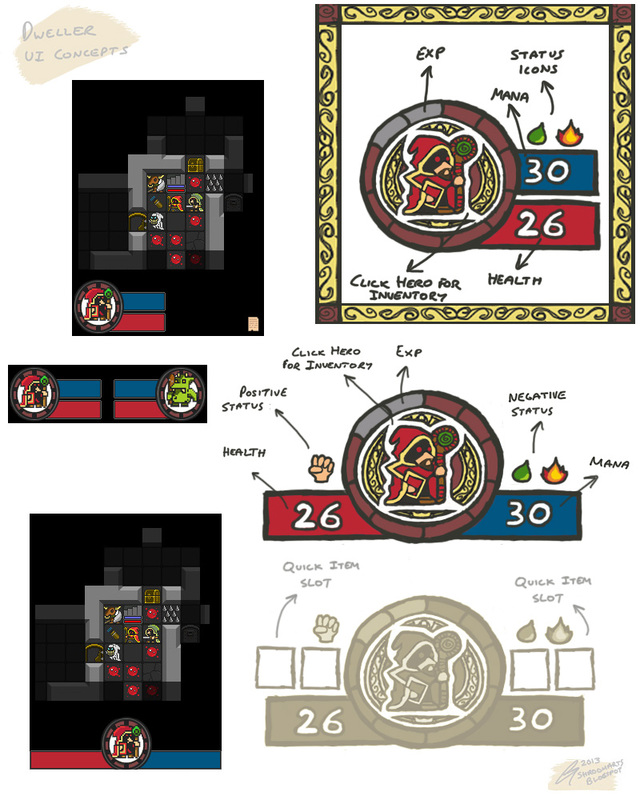 Thats not to say Dweller didn't already have a great platform established... but now that we have a dedicated graphic designer working on it, the game seems meatier. yum! the reason behind this post is to gather feedback before implementing. i am surprised there is so little feedback yet. if you want to insert new interface to the game, you need to do it like an option. i agree on it being optional. players should not be forced into major changes and everything should be configurable from the options menu as "new" and "classic". i also think this sort of numerical stats would work better for 240x like here http://v1t3r.at.ua/pictures/Dweller/ui/main.png and i have already suggested it to björn. also all additional panels,like quickslots, should be hidden then they doesn't need. Do it maximum custumizeble(more settings), please. Under interface you can pick decorative or plain. like i said before, i agree on optional stuff. everything since mr shroom came on board has just enhanced dweller so much. We need to also divide the inventory on the sell list for the merchants -all items that are unusable by that character class should be in a separate list with a "sell all" feature. this wold speed up the game greatly. Excellent news and excellent interface! Thank's a lot.